Where in the world is my dog from? For thousands of years, dogs have accompanied humans as we moved around the world. Wherever we settled, our furry friends would settle too, and as we mingled with other peoples, so did our dogs. This mingling has left us with a wonderful diversity of dog breeds, each of which can be traced back to a particular place in the world. It's no surprise then that many dog breeds are associated with a particular place or country and have that country or place of origin in their name (think German Shepherds, Tibetan Mastiffs, Siberian Huskies, etc). While in some cases figuring out where your dog's ancestors are from is easy, in others it's not so clear. 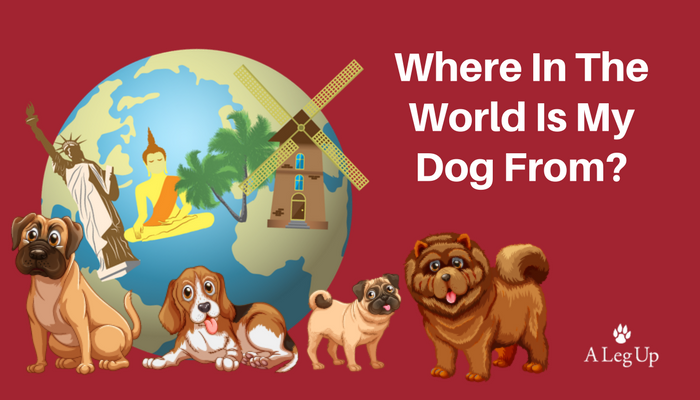 Are you wondering where in the world your dog is from? Here's a quick Atlas of Dog Breeds that will get you thinking of how international your pup really is!